The Financial District (FiDi) is located on the southern tip of Manhattan, roughly overlapping the New Amsterdam settlement on New York Harbor (officially Upper New York Bay) in 1625— on one of the world’s largest natural harbors. Containing many of New York’s oldest structures, many of the world’s tallest buildings, and a population of around 43,000 (2014). The first legally charted city in America. Technically the Financial District excludes Battery Park and overlaps with Civic Center and Tribeca (separate post). * Asterisk denotes a place I haven’t yet visited properly. Beekman Street. №140 was Carmine’s Italian Seafood (1903 to 2010), which closed after 107 years — the original wooden bar was shipped to the Old Stein Inn near Annapolis. Broad Street. 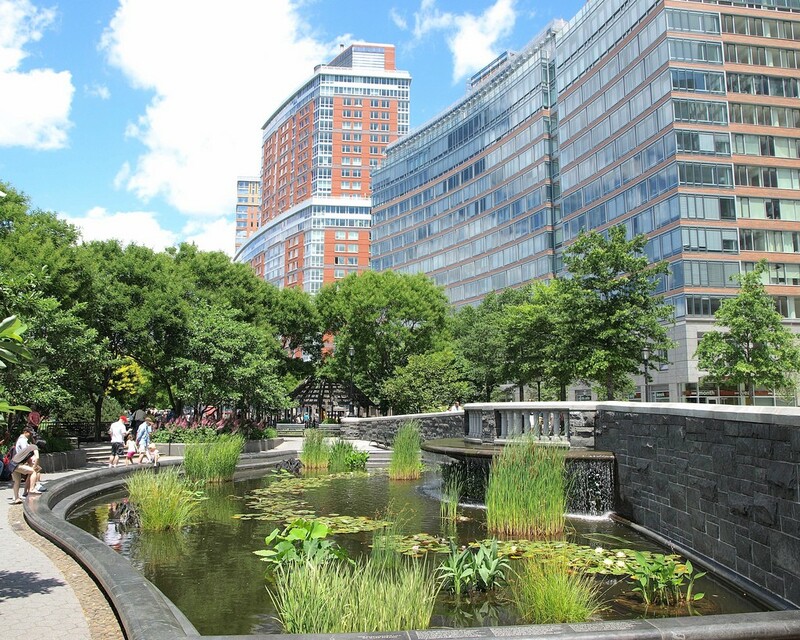 Once a canal, and its banks the site of New Amsterdam’s first marketplace. Duane Street. №9 was the largest and most well-known children’s lodging house named the Duane Street Lodging House but also known as The Newsboys’ Lodging House — which ran from 1874 to 1929. Edgar Street. The shortest street in Manhattan at 63-feet — followed by nearby Mill Lane. John Street. 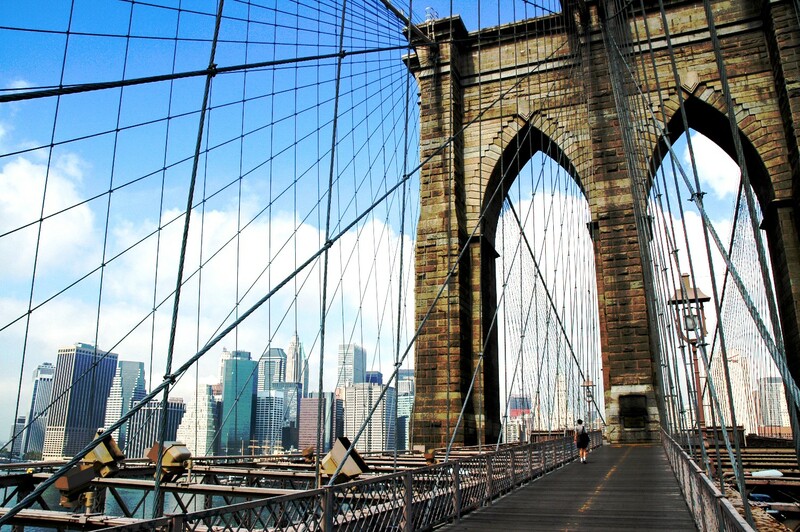 №81 had the first paid telephone in 1877, which connected to Brooklyn via a wire running along the then-unfinished Brooklyn Bridge. №15–21 was the John Street Theatre (1767 to 1798) known as “The Birthplace of American Theatre” (the first permanent theatre in the city and the only theatre in Manhattan for 31 years) — and featured the city’s first performances of The Merchant of Venice, Macbeth, King John, As You Like It, Much Ado About Nothing, The Critic and The Archers (considered America’s earliest musical). In 1767, nine Cherokee chiefs performed a war dance following a performance of Richard III. In 1769, the first US blackface performance of Mungo in The Padlock. In 1774, temporarily closed after stage plays were banned for “extravagance and dissipation”. In 1777, renamed the Theatre Royal after capture by British forces. In 1787, in the play The Contrast a character visits the John Street Theatre and mistakes a scene acted on stage for real-life (meta)! In 1789, George Washington watched three plays. Maiden Lane. Named for Dutch maidens who washed laundry in a stream where the lane now stands. At №57 is a plaque commemorating the residence of the third US president. The first recorded play, The Recruiting Officer, was performed at the New Theatre on Nassau Street. Pearl Street. Marks the original shoreline and gets its name from “mother of pearl” oyster shells washed up along shore. Site of the city’s first market, first church (small plaque on Whitehall and Pearl) and first printing press (plaque at №81) — site of the city’s first newspaper, The New York Gazette, and first printed map of the city. Stone Street. One of the first to be paved with a lost section represented by a brown brick pathway that passes through the (publicly accessible) lobby of №85 Broad St, which includes a map of the original New Amsterdam street layout. 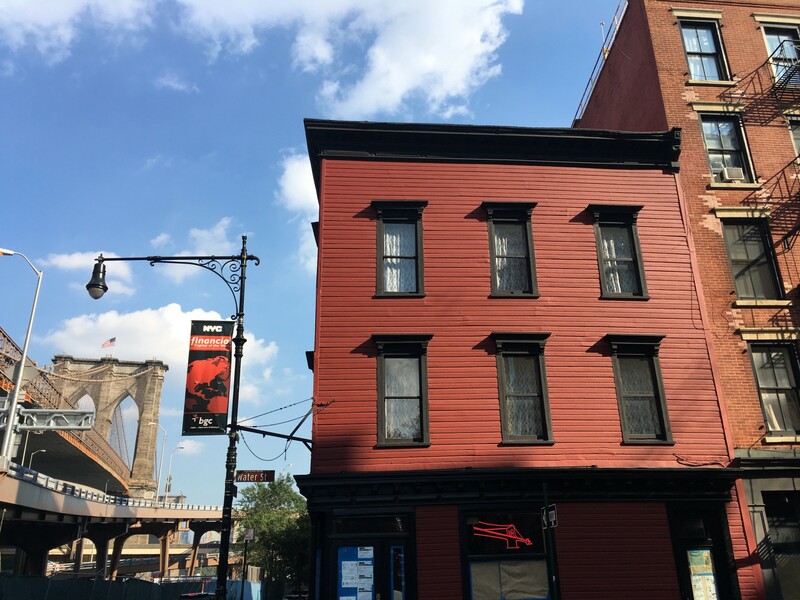 At the corner of Stone and Mill St stood the home of the first Jewish citizen to the city, who went on to become of the wealthiest men in town as the first kosher butcher in the New World. The starting end of the city’s “hardened artery” and oldest road — originally an Indian trail called Weckquasgeek that followed a natural ridge. Named “Broad Way” after the road was widened, it runs all the way up to the state’s capital, Albany. №9 is where relatives congregated to hear news of the Titanic, which included one of the world’s richest men (Astor IV), the brother of the Guggenheim founder, and co-owner of Macy’s. №39 has a plaque for the second Presidential mansion, Alexander Macomb House, and thought to be the site of the first European dwellings (four wooden huts). Occupied by George Washington in 1790. №50 is where the first skyscraper stood with the first iron skeleton and first passenger elevator. On windy days crowds gathered to place bets on when it would blow down prompting the designer and prominent architect, Cass Gilbert, to climb to the top during a gale (he was accompanied by the building owner who lost his nerve halfway up). №66 was once the Manhattan Insurance Building — the tallest skyscraper in the world and in 1963, the tallest ever purposely demolished. №120 was once the Equitable Building — the world’s first skyscraper and tallest office block in the world, first with passenger elevators. Advertised as fireproof, it burned down in 1912. №140 holds Red Cube, a 1968 sculpture by American-Japanese artist Isamu Noguchi. №153 was the site of first moving picture — a four-minute boxing match filmed on the roof of the MSG. Owned by the governor and named after the second governor of England. 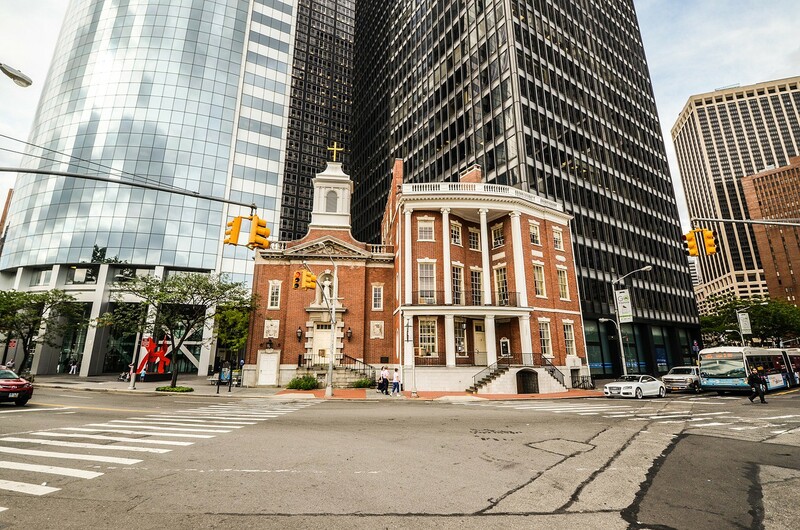 In business from 1670 until burning down, the building’s remains were discovered in 1976 at №85 Broad St and resulted in the city’s first major urban dig. Practically the only remaining connection to the Dutch period, it lies beside the outline of Stadt Huys — the old Dutch City Hall. Claimed to be Manhattan’s oldest surviving building and the only 18th century building to survive the Great Fire of 1835, which burned for 24 hours while the East River lay frozen. 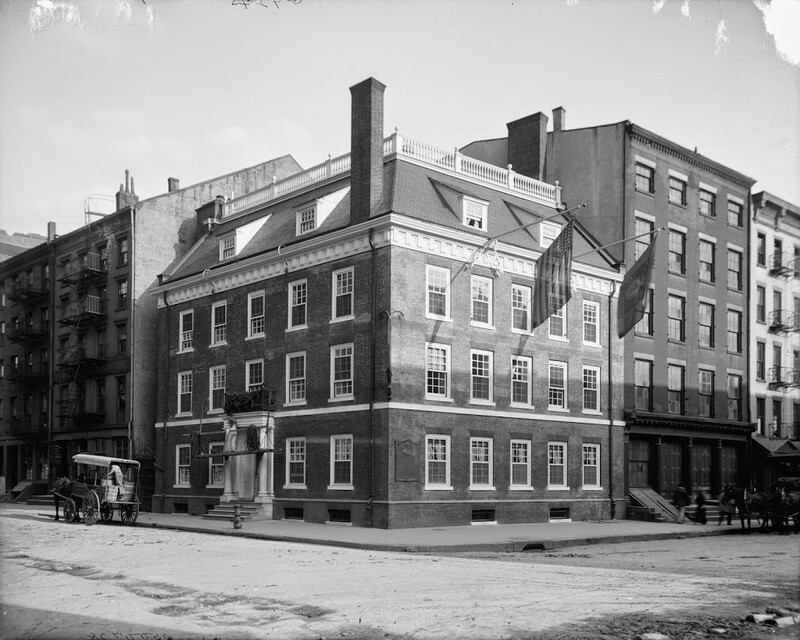 A former De Lancey household, Queen’s Head tavern (site of the Sons of Liberty Tea Party plot), and headquarters of George Washington (peace negotiations with the British, department of Foreign Affairs). Now a Gorge Washington museum on the upper floors (lock of hair, tooth fragment, portraits, Long Room, Clinton Room, Federal dining room) and part of the American Whiskey Trail. Saved from demolition in 1900 by the Daughters of the American Revolution (by designating the building as a park to protect it), acquired by the Sons of the Revolution (using money left by Washington’s chief of intelligence, plaque affixed to the building), and reconstructed (not restored) in 1907. In 1775, a cannonball from the battleship Asia crashed through the roof. In 1783, Evacuation Day celebrations were held at the tavern. Nine days later George Washington gave his farewell address to the Continental Army. Fun fact: When he became President he only had one tooth left (false teeth made of ivory, gold and human teeth)! 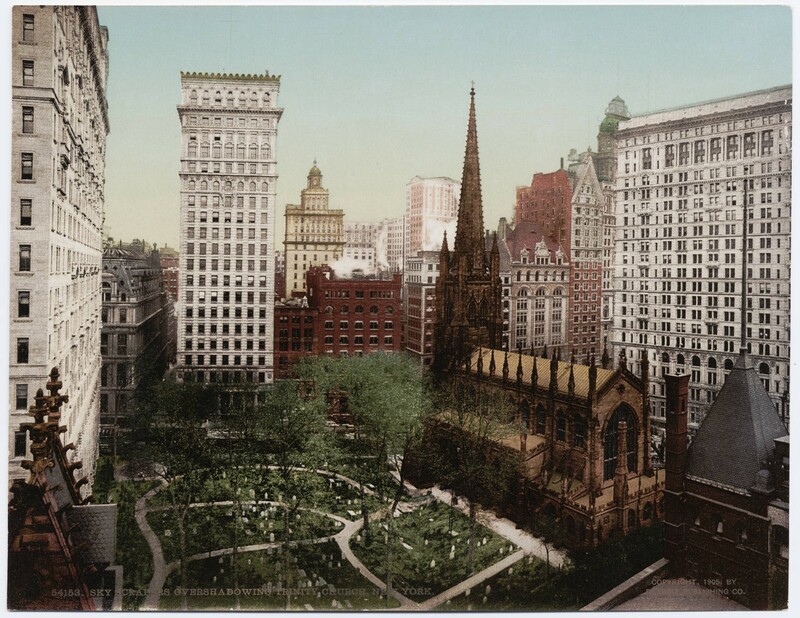 The oldest public park in the city originally housed a bowling green and is surrounded by its original eighteenth century fence (one of the oldest Manhattan structures, original saw marks where the English crowns were cut off) — built to protect a statue of King George III from vandalism, which was torn down immediately after the Declaration of Independence was read and turned into 42,000 bullets to fight the British! Eight pieces of the statue remain today (the head was sent to England at the time by Loyalists, some at the New-York Historical Society). Over the years a parade ground, cattle market, the first public well, Governor house and Customs house. One of two subway control stations to New York’s first subway. Contains memorials to the first Italian settler (1635, killed during the Peach War, June 2 is known as “Alberti Day” in the Italian community), father of the American Presbyterianism and religious tolerance; and Evacuation Day. As a last gesture on Evacuation Day the British raised a Union Jack then cut the rope and greased the pole. A young sailor used nails as cleats to swap the flag moments before George Washington rode into town! 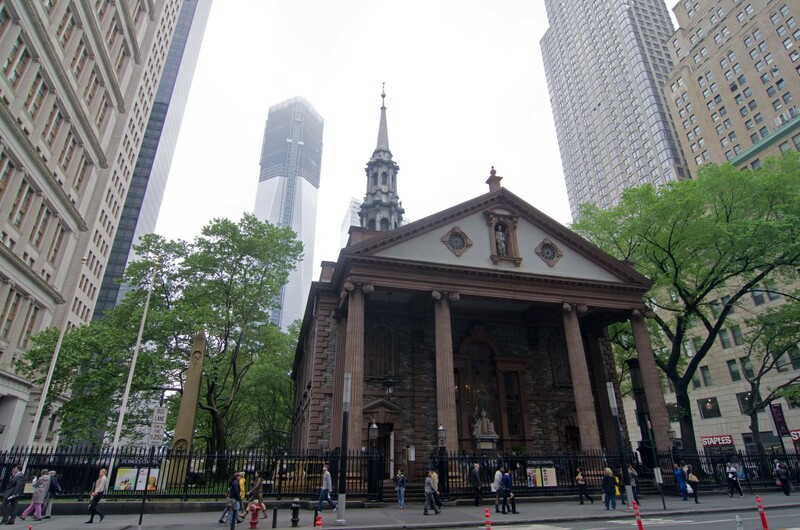 “The Little Chapel That Stood” is Manhattan’s oldest standing church, oldest continual use building, and was the tallest building. George Washington worshipped here on his Inauguration Day and above Washington’s replica pew is the first known full color seal of the US (the bird looks like a turkey). The pulpit is topped by a gilded coronet — likely the only public British symbol left from before the Revolution (as the church was shuttered from vandals). Prince William (later King William IV) and three US presidents (Cleveland, Harrison, W. Bush) worshiped here. Outside is the first American military monument (to the first officer to die during the Revolution). In the cemetery is an 1866 obelisk was used to launder money by an Irish-American group to buy guns for an invasion of Canada, which was to be used as hostage to free Ireland from English rule! The “invasion” resulted in five attacks, thousands dead, and strained relations between the US and Canada for years. Completely unharmed from the 9/11 attacks thanks to a giant sycamore tree (the stump remains as a memorial), a fence around the church grounds became the main location for memorials. After it was filled, officials decided to erect 15 panels for visitor memorials, which eventually grew to 400 panels — several of which were woven together and hung from the upper level. Home of the first Speaker of the New York State Assembly, hotel, Mission of Our Lady of the Rosary (for young immigrant women, relocated next door), and now a rectory and shrine. It is believed the wooden columns are from old ship masts. Historic district featuring the largest concentration of restored (1980s) early 19th-century commercial buildings in the city. 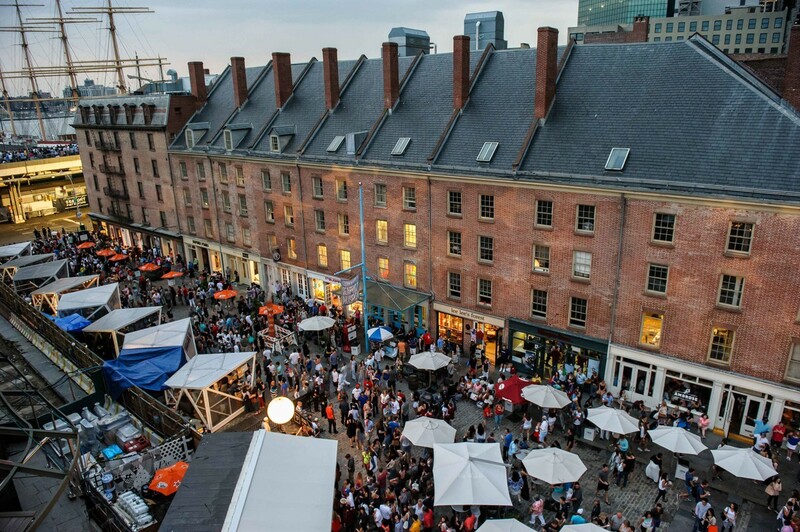 Includes renovated mercantile buildings, renovated sailing ships, the former Fulton Fish Market (1822, relocated in 2005), and modern shops amongst cobblestones. The block of buildings on the southwest side is known as Schermerhorn Row (after the original owner). The South Street Seaport Museum opened in 1967 and contains exhibition galleries, a working 19th-century print shop, archeology museum, maritime library, craft center, marine life conservation lab, and the largest privately owned fleet of historic ships in the country — five docked ships with the most notable being the Wavertree, built in 1885 and the largest iron sailing vessel afloat. The Titanic Memorial (1912) lighthouse was erected in 1976. 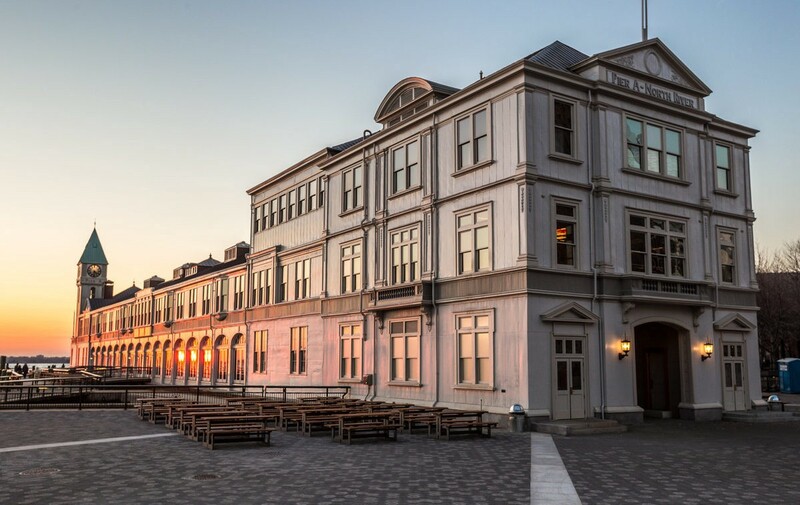 Originally the West Battery then Castle Garden — a fort built prior to the War of 1812 that has since been a beer garden, theatre, immigration depot (the world’s first, 40 years before Ellis Island, processed 8 million immigrants), and aquarium. Now a small history exhibit, concert venue, and ticket office for the Statue of Liberty and Ellis Island tours. Before landfill, it stood on an island 275m (800ft) offshore connected by drawbridge. The fourth and oldest remaining location of one of the nation’s top fine dining restaurants. The first restaurant in New York, first printed menu, first separate wine list, first individual tables, and first tablecloths. The birthplace of the famous Delmonico steak (boneless ribeye), Hamburg steak (forerunner to the hamburger), Wedge salad, Baked Alaska, and Oyster Rockerfeller. Claimed birthplace of Eggs Benedict and Lobster Newberg (claimed). The entrance columns are ‘said’ to be from the ruins of Pompeii. Beginning in the 1850s, the restaurant hosted the annual gathering of the New England Society of New York. In 1862, the restaurant hired Charles Ranhofer, considered one of the greatest chefs of his day. The business was so successful that at various times there were ten locations. Notable patrons included Roosevelt, Mark Twain, “Diamon Jim” Brady, Charles Dickens, Oscar Wilde, J.P. Morgan, Nikola Tesla, Prince Edward VII and Napoleon III. Site of the foundation of the US government: Congress of the Confederation, Stamp Act Congress (against “taxation without representation”), the first Capitol building (with the first Federal architecture), George Washington’s inauguration, establishment of freedom of the press (libel case), the Bill of Rights, ten Constitutional amendments, and the Judiciary Act (the federal court system). The original building was demolished in 1812 and replaced by a Customs House turned sub-treasury (vaults below) and now a memorial. Columns resemble the Greek Parthenon (democracy) while the dome echoes the Roman Pantheon (republican ideals). Houses the Inauguration Gallery (railing, balcony floor, oath Bible) and other exhibits. George W. Bush used the inauguration bible exactly 200 years after Washington. The 1882 bronze statue of Washington stands on the approximate spot of the inauguration. A bronze map of Ohio commemorates the Ohio Company — a group of revolution soldiers who settled the northwest. In 1920, the Wall Street bombing (38 killed, 400 injured) occurred across the street. In 2002, as a show of support following 9/11 Congress met in the building for the first time in New York since 1790. The third and current incarnation was designed by the first American Institute of Architects and held the title of tallest building in the US until 1869. The bronze doors were designed by the same architect as the Statue of Liberty pedestal. In 1976 — exactly 200 years after the statue of her ancestor King George III had been toppled in Bowling Green — Queen Elizabeth II and Prince Philip visited and were presented with “back rent” of 279 peppercorns (King William III, in 1697, called for the parish to pay an annual rent of one peppercorn to the Crown). 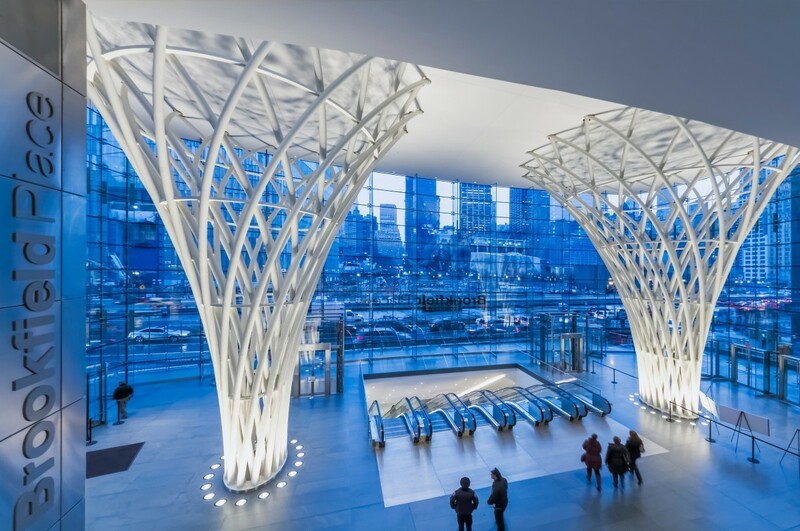 Contains a bronze sculpture of the sycamore tree roots that saved St. Paul’s from harm during 9/11. The cemetery tombstone of James Leeson contains Masonic symbols in a Freemason’s (pigpen) cipher that took nearly a century to crack (decrypted: “remember death”) and Charlotte Temple — a fictional character that stood for 200 years before being examined in 2008 to reveal no body beneath. Also buried are Alexander Hamilton, George Strong (Civil War diary), William Bradford (the first NY newspaper), Francis Lewis (Declaration of Independence signer), Albert Gallatin (NYU founder) and Robert Fulton (steamboat inventor). In 1705, granted 200 acres of land by Queen Anne — it still owns 26 commercial buildings making it the richest parish in the world. In 1709, founded the oldest educational establishment (Trinity School). 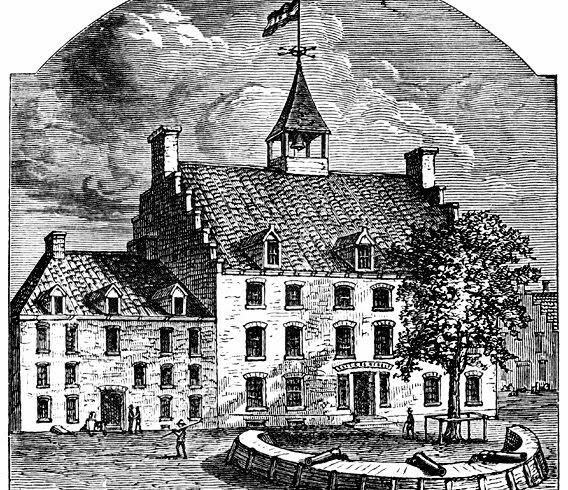 In 1754, granted land for King’s College (now Columbia University). Owns first rights to all Manhattan shipwrecks and beached whales! Former brothel and claimant to the oldest bar in New York. At least two recorded murders. Prosperous during Prohibition. Named in honor of the Dutch West India Company and home to the The India House Club of entrepreneurs in international trade since 1914. Former bank and Cotton Exchange — the first US commodity market. Nearby Hanover Square is actually a triangle and contains the Queen Elizabeth II September 11th Garden to the 67 British victims of 9/11 (dedicated by the Prince of Wales in 2005 and opened by the Queen in 2010). Named after the first battery of cannons protecting New Amsterdam. The center of Evacuation Day celebrations and expanded using landfill from the World Trade Center excavation. During the 1970s and 1980s the landfill was a huge beach (accessible by crawling through a fence) beside the Twin Towers, which held an anti-nuke rally in 1979 (200,000 people) and Art on the Beach public art project from 1977 to 1985. Includes Castle Clinton (1808), City Pier A (1886), Battery Gardens restaurant, and the SeaGlass Carousel (2016). Contains the Netherlands Memorial (1926) commemorating the 300th anniversary of Peter Minuit’s (in)famous $24 “purchase” of Manhattan from local Indians — even though there is no document of sale and the depiction is incorrect (war bonnet never worn by Manhattan Indians). Other monuments include a 9/11 eternal flame, Hope Garden (AIDS victims), East Coast Memorial (1959, Battle of the Atlantic, eagle faces the Statue of Liberty), Korean War Memorial, Walloon Monument (Walloon Huguenots that founded New York), Ericsson statue (designer of iron warships), Verrazano statue (first European to sail into the harbor) and The Sphere — a sculpture recovered from the World Trade Center after 9/11. In 2005, the remains of a 200-year-old stone wall — the oldest man-made structure still in place in Manhattan — were unearthed. A portion is viewable in the South Ferry subway station at the original discovered depth. 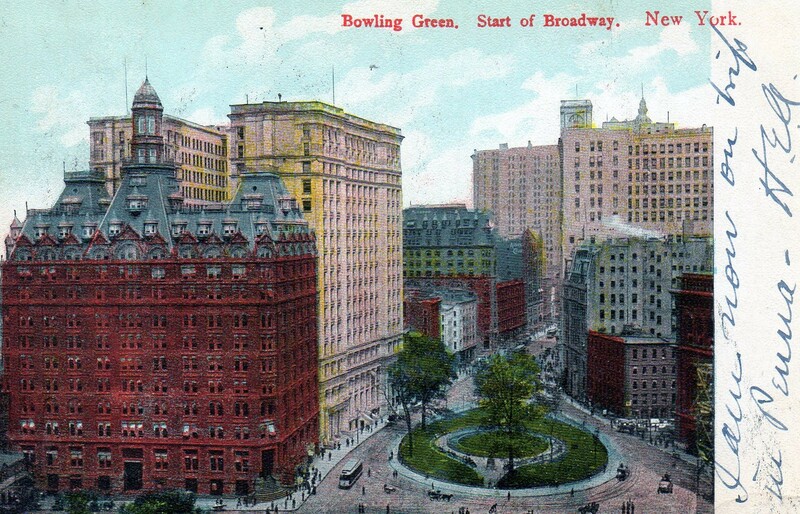 №1 Broadway was once the Kennedy mansion, which housed George Washington. It was the headquarters of the British commander (Clinton), then Washington again, and finally a hotel before being destroyed. The current building housed the last US company to operate passenger ships across the Atlantic — complete with separate entrances for cabin and first class! 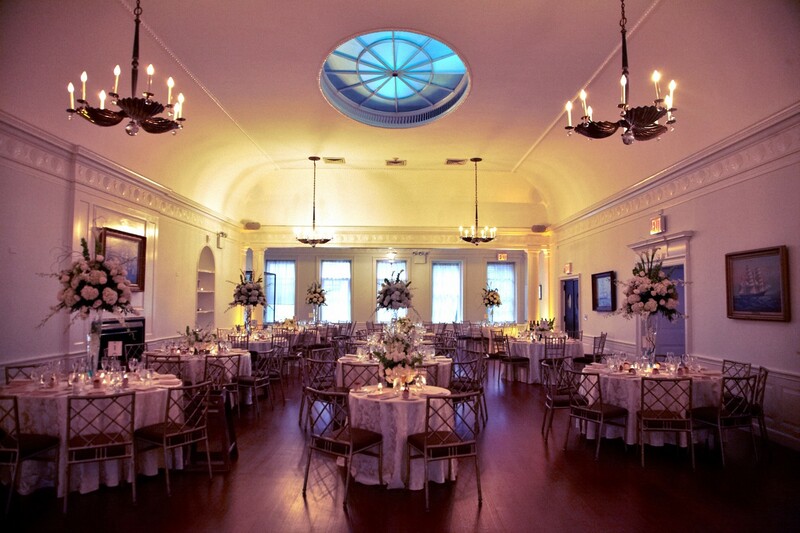 The grand bookings hall was designed to resemble an eighteenth century ballroom. The East River Bridge until 1915, it is one of the oldest bridges in the US and the first steel-wire suspension bridge in the world (50% longer than any previous suspension bridge at the time). Designed to be six times as strong as need, one of the cable suppliers stole funds by using inferior wire leading to the addition of 250 extra cables. The diagonal cables from the towers are not necessary, but kept for aesthetic reasons. Large vaults on either side were used to store wine (!) and later a fallout shelter. Used by 10,000 pedestrians and 3,500 bikers (avoid riding) each day. “Love locks” along the railing and falcons nest at the top. “Boss” Tweed syphoned around $6 million from the project and 27 people died during construction — including its creator John Roebling, who crushed his foot during a survey and died of complications. His son took over the project, but contracted the bends (an unknown condition at the time) and was confined to his apartment for the remaining 11 years of the project. He was heavily aided by his wife — an early pioneer for equality and the first person to cross the bridge (with a rooster for good luck). A bronze plague on one of the bridge’s anchorages was once 1 Cherry St — Osgood House, a forerunner to the White House and first Presidential Mansion and house of George Washington during New York’s two-year period as the capital (run by Samuel Fraunces). The bridge appears in the films Annie Hall, Gangs of New York, Kate & Leopold, It Happened in Brooklyn, Independence Day, I Am Legend, The Dark Knight Rises, Once Upon a Time in America, The Avengers, and Godzilla. “Liberty Gateway” is the city’s last surviving historic pier. In 1919, a ship’s clock was installed in the tower as the first US WWI memorial. Former fireboat station and now a restaurant. 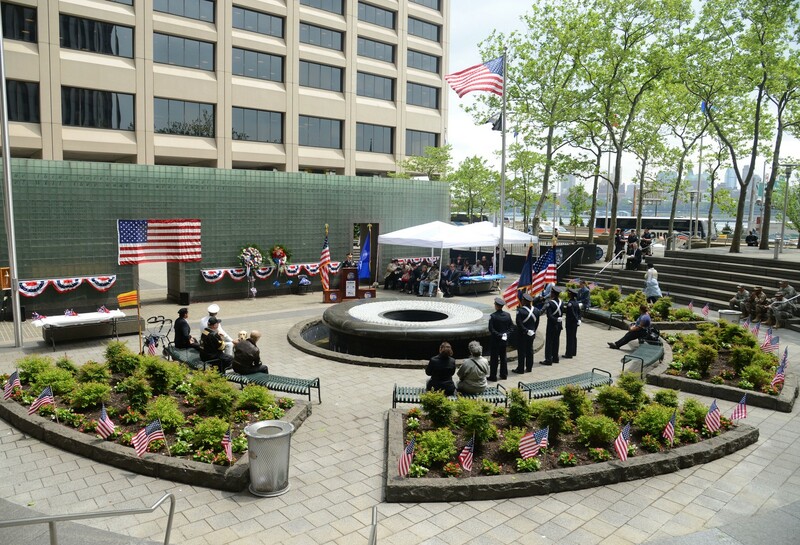 In 1991, the American Merchant Mariners’ Memorial was installed in the Hudson River. It depicts the scene from a German photo of the aftermath following a U-boat attack on the U.S. oil tanker, Muskogee. The photo was kept for 40 years by a US soldier — even as a prisoner of war — before being analyzed by the FBI. None of the American sailors survived. The seaman in the water is fully submerged at high tide. Standing on the site of the Chapel Street Theatre, a “Theatre Alley” venue that held the first New York performance of Hamlet in 1761 and an early Patriots meeting in 1765. In the 1830s, Clinton Hall was built — an educational institution with extensive Mercantile Library, which became a fundamental part of the Astor Place Library. Here Edgar Allen Poe worked and the first NYU class was held. Named for London’s Temple district, the current building features a nine-story Victorian atrium crowned by a large pyramidal skylight. 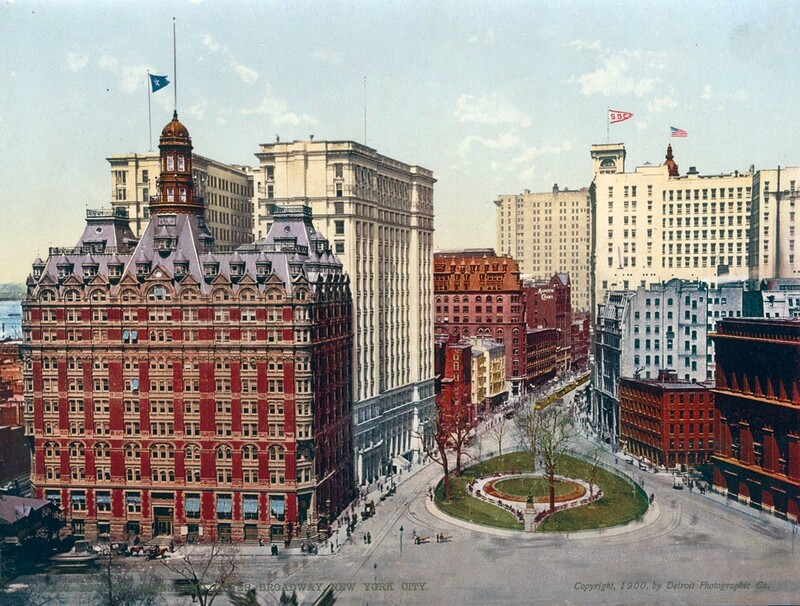 The first high-rise building in New York and one of the first modern office buildings. Deemed fireproof, it caught fire in 1893. In the 1940s, new fire codes required the atrium be sealed — which remained for nearly 70 years (no photos exist prior to this). Featured in shows White Collar, Person of Interest, and Law & Order. 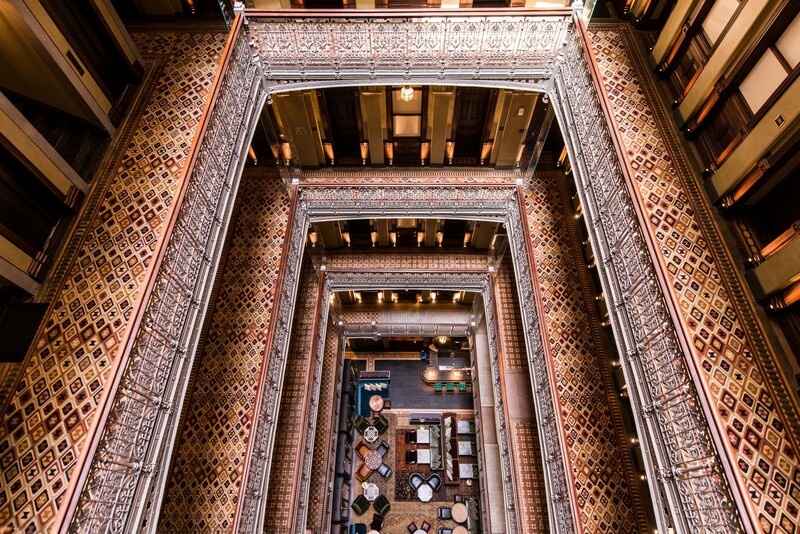 In 2006, after extensive renovations re-opened as The Beekman Hotel — complete with atrium cocktail bar and restaurant named after scientists who once occupied the building. 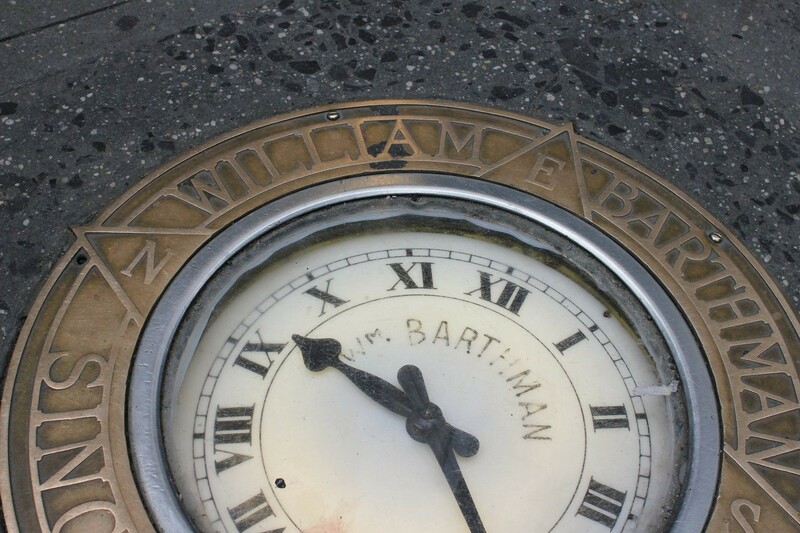 “Downtown Tiffany” is a custom working clock installed into the sidewalk by the oldest remaining jeweler in New York, William Barthman Jewelers. It turned out to be so much of an embarrassment when the clock began to malfunction that it was covered with cardboard each day. Replaced in 1917 and serviced from a small underground passageway from the store, which also displays historic photos. A thin crack near the XII is a result of 9/11. An estimated 50,000 people walk over the timepiece each day. 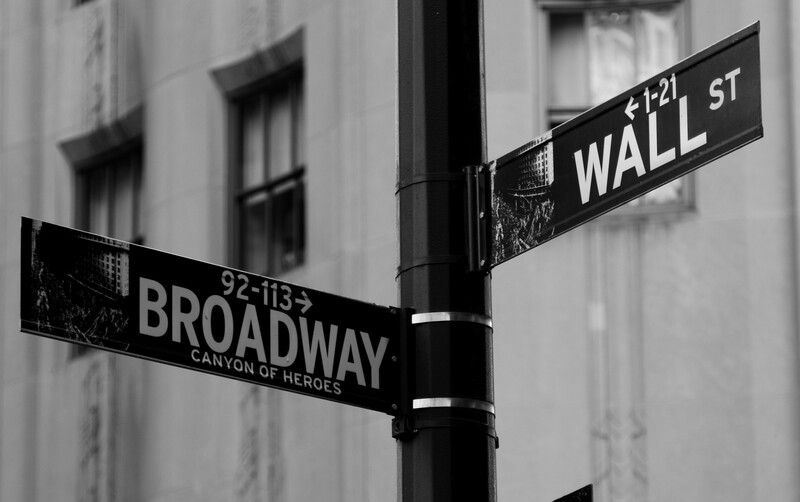 An eight-block area of financial markets and home to the world’s two largest stock exchanges — the “Big Board” New York Stock Exchange (NYSE, $169 billion traded daily) and the NASDAQ. 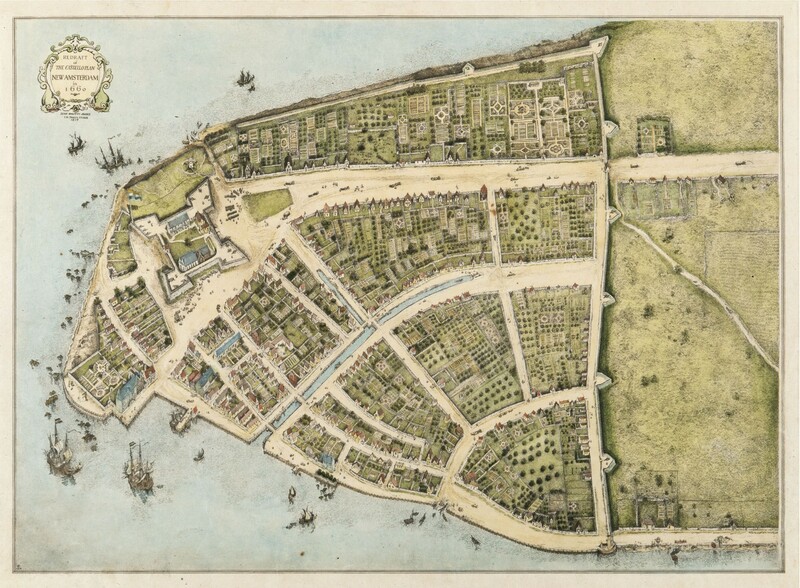 Named for the wall along the New Amsterdam settlement, it was the city’s first official slave market. 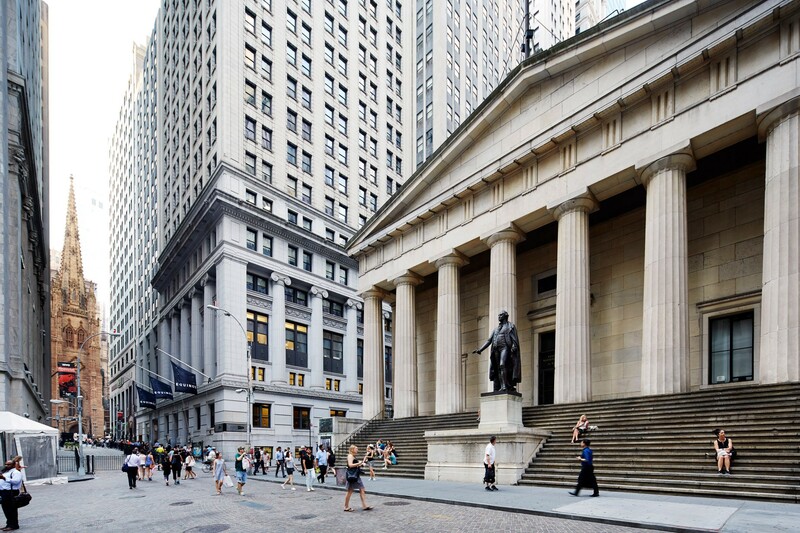 The NYSE was born in 1792 when 24 stock traders signed the “Buttonwood Agreement” under a buttonwood (sycamore tree) at present day 68 Wall St. Outside the current Stock Exchange is a small buttonwood tree symbolizing the agreement. In 1867, stock tickers were introduced. In 1884, Charles Down began trading stocks and coined the terms “bull market” (averages high), “bear market” (averages low) and the “Dow Jones Industrial Average” (DJIA). In 1889 the original stock report, Customers’ Afternoon Letter, became The Wall Street Journal. 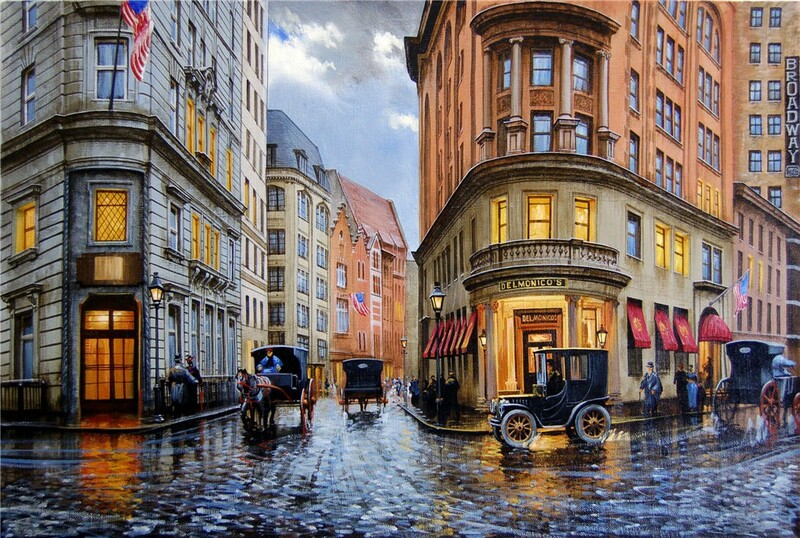 In 1903, the NYSE moved from Tontine’s Coffee House (82 Wall St) to its current located at 18 Broad St. In 1909, trading of bonds began. In 1914, World War I caused the longest exchange shutdown (4.5 months) — upon reopening saw the largest single-day drop of 24.4%. In 1920, a bomb exploded outside the NYSE building, killing 33 people and injuring more than 400; the perpetrators were never found. In 1929, The Black Thursday crash ushered in the Great Depression. In 1943, the trading floor was opened to women. 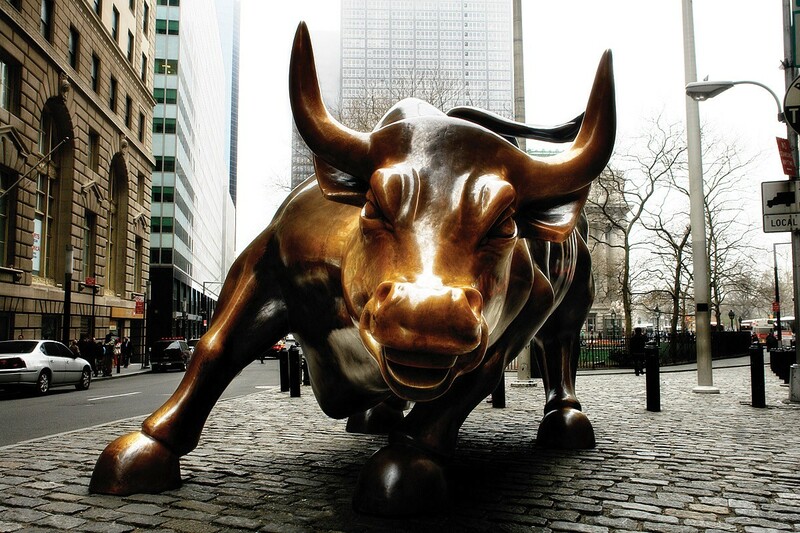 In 1949, the longest (eight-year) bull market began. In 1967, protesters led by Abbie Hoffman threw mostly fake dollar bills at traders from the gallery, leading to the installation of bullet-proof glass. In 1987, Black Monday saw the second-largest one-day DJIA percentage drop (22.6%). In 1995, the first electronic trade (of IBM stock) was placed. In 1995, the tradition of highly publicized guests ringing the opening bell began (ringers sign a private autograph wall). In 1996, a real-time ticker was introduced. 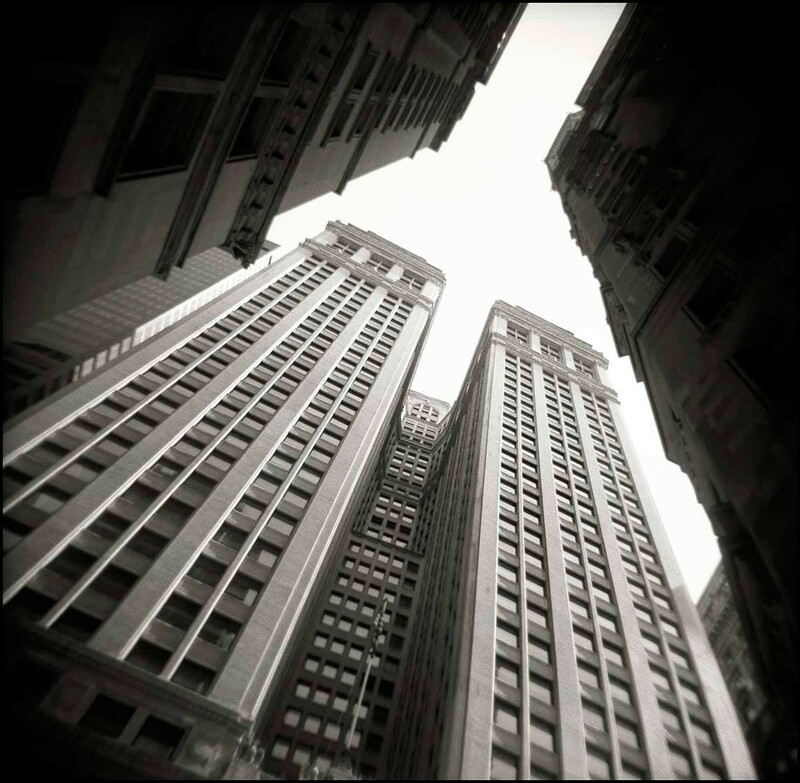 In 1997, the Asian Financial Crisis caused a 7.18% drop. In 1998, the city struck a $900 million deal to keep the NYSE from moving to Jersey City. In 2000, Rage Against the Machine were escorted out during the filming of the music video “Sleep Now in the Fire” (directed by Michael Moore). In 2001, trading in fractions ended. In 2001, following 9/11 the NYSE was closed for 4 trading sessions and lost $1.4 trillion within five days of trading (leading to circuit breaker rules). In 2007, President George W. Bush turned up unannounced before an interest-rate decision. In 2008, the start of the Global Financial Crisis . 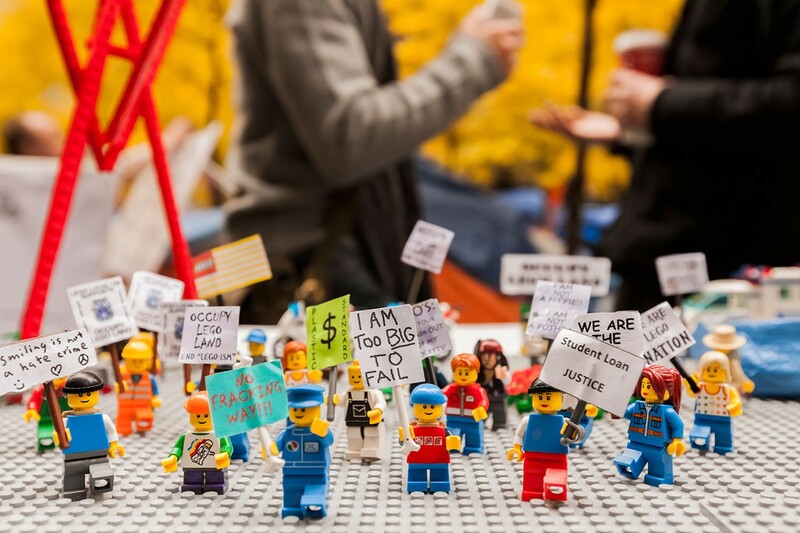 In 2011, the target of Occupy Wall Street demonstrations. In 2012, trading shut for 2 days due to Hurricane Sandy. In 2014, the highest priced shares (Berkshire Hathaway’s A Class) hit $200,000 a share. 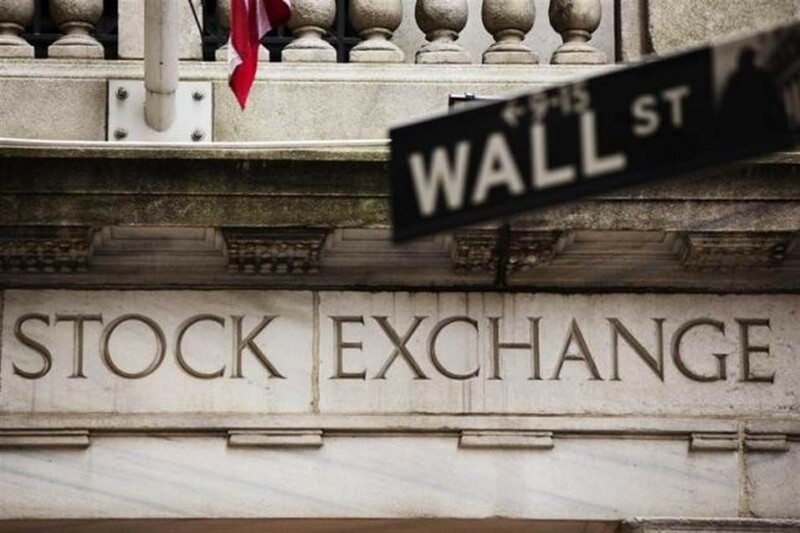 Until 2005, the right to directly trade shares on the exchange was limited to 1366 “seats” — a term derived from chairs the original NYSE members sat in to trade. The Barnes family is the only known lineage to have five generations of NYSE members. The most expensive seat was sold in 1929 for $625,000, which would be over six million dollars today. Large glass windows designed to flood light on the trading floor have since been darkened to allow traders to see computer monitors better. The signal to start and stop trading was originally a gavel (still in use today along with the bell), then gong, before switching to a bell in 1903. Stock traders with 25 years experience are admitted to the Buttonwood Club (no benefits, just a pin). 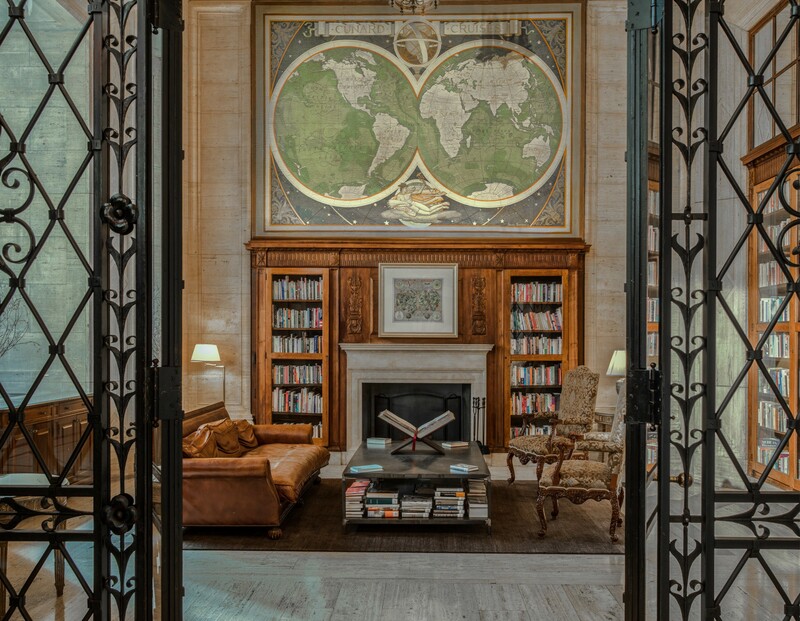 Within the building is the largest Faberge in the world, an 1867 clock, invite-only restaurant (with secret dining room), framed Civil War bonds, Led Zeppelin guitar, Andy Warhol artworks, Wall of Innovators, and the original Buttonwood Agreement. The Stock Exchange Luncheon Club was a lavishly decorated members-only dining club on the seventh floor of the New York Stock Exchange (NYSE) at 11 Wall Street — which closed in 2006 after more than a century. The first African American member joined in 1970 and was given a table on which to dine alone. A ladies’ restroom was installed twenty years after women were first admitted. 1 Wall St has a great art deco interior is the headquarters of New York Mellon Corporation — the world’s largest deposit bank. “City Hall Loop” was the starting point of New York’s first subway, built by the Interborough Rapid Transit Company (IRT) and named the Manhattan Main Line. On opening day, over 100,000 descended and sang in the cars with the first departure controlled by the mayor. 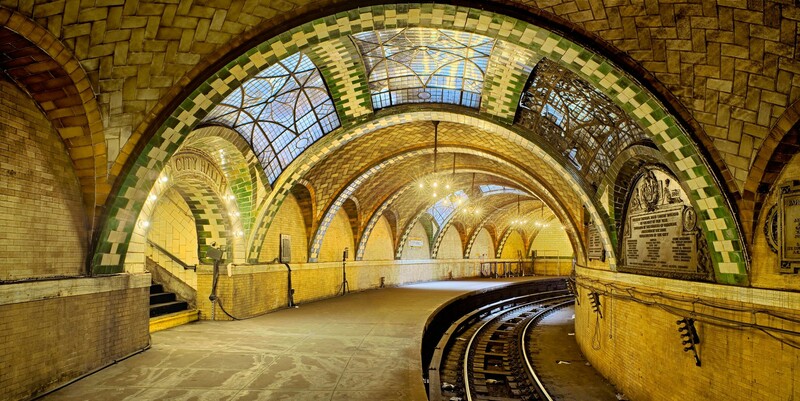 Featuring colored tile, vaults, chandeliers, and an ornamented oak ticket booth — the upper classes would dress up just to dine at the station! At street level in front of City Hall is a plaque (1900) and concrete slab with glass skylights to the platform below. Closed due to inactivity (only 600 passengers a day) and a curved platform that could only service five cars. For the 2004 Centennial Celebration, one of the street entrances was restored and the station opened. Tours reopened in 2006. Another way to see the station is to ignore any announcements and stay on the 6 train after the last stop — the station is visible on the right side as the train turns around! On roughly the same site as Fort Amsterdam — a Dutch West India Company fortification and founding center of New Amsterdam, which held the first meeting of New York legislature and originally stood by the sea before being demolished 1790. Also the site of Government House, the house of the first two governors. Currently the George Gustav Heye Center (a Smithsonian branch of the National Museum of the American Indian), Bankruptcy Court, and National Archives. Designed by the same architect (Gilbert) as the Woolworth Building, and features portraits of the Eight Races of Mankind, a rotunda dome with mural, sculptures dedicated to the Four Continents (Asia, America, Europe, Africa), and statues of each of the great seafaring nations — including Belgium, which only has 40 miles of coastline and no navy! 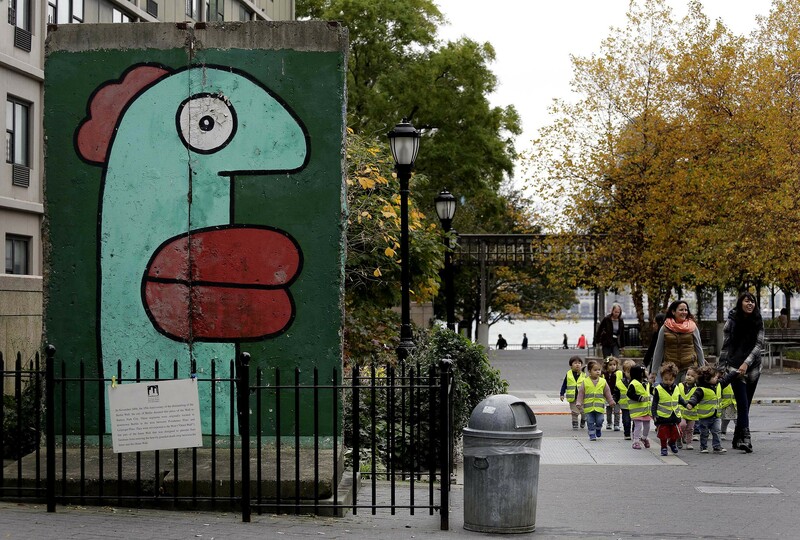 Originally Germany, it was changed due to anti-German sentiments during WWII. Two ferry buildings (Battery Maritime Building and Staten Island Ferry Whitehall Terminal) on the site of New York’s first pier. Named after the South Ferry Company, which ran services to South Brooklyn. 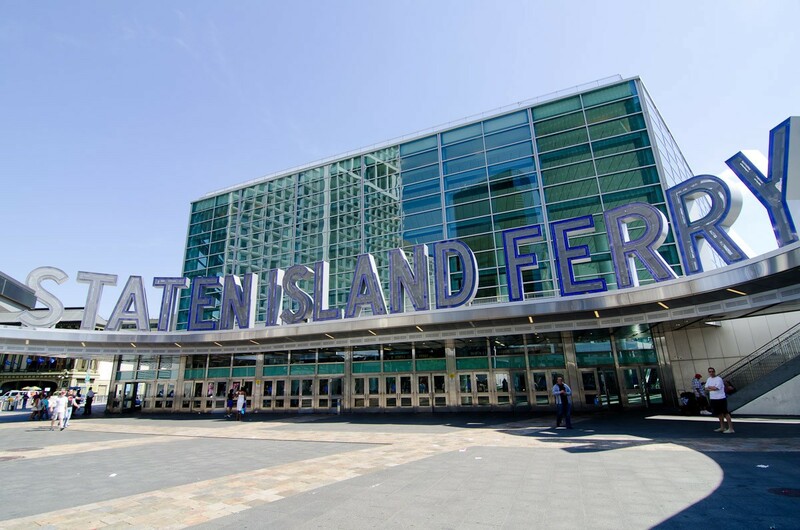 Open 24/7 and carries 70,000 passengers daily to Governors Island and Staten Island. The Municipal Ferry Terminal (Battery Maritime) was built in 1909 and serviced Brooklyn (until 1938), Governors Island (for the US Army until 1996), Staten Island, and Weehawken. It was connected to a system of elevated trains, gutted by fire in 1991, and restored in 2005. 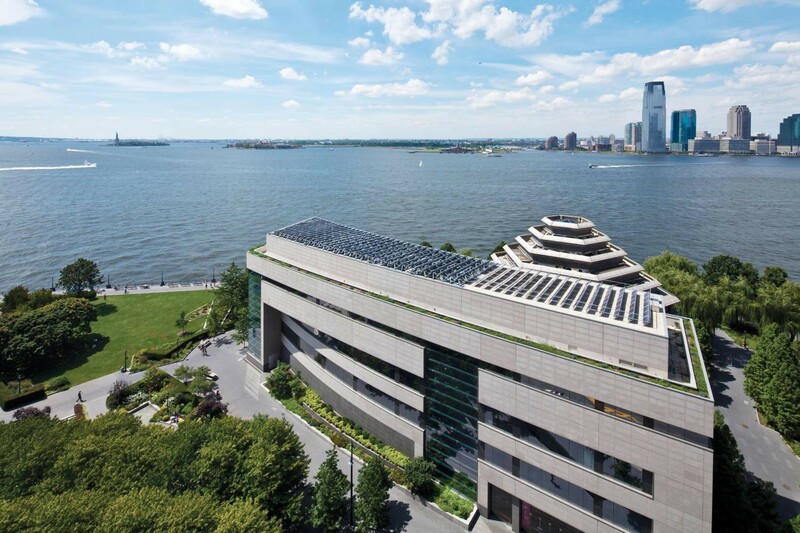 The Whitehall Terminal features large windows facing the harbor, a rooftop viewing deck, indoor farmer’s market (GrowNYC), and Whitehall Crossing — 28 sculptured granite benches in the waiting room symbolizing Indian canoes crossing New York Bay. Outside is Peter Minuit Plaza, which contains the New Amsterdam Plein and Pavilion — an “outdoor living room” set amongst tulip beds and designed to resemble the opening petals of a tulip. A 2009 gift from the Netherlands to commemorate New York’s 400th anniversary. Hosts a light show every night at midnight (Minuit translates to midnight). 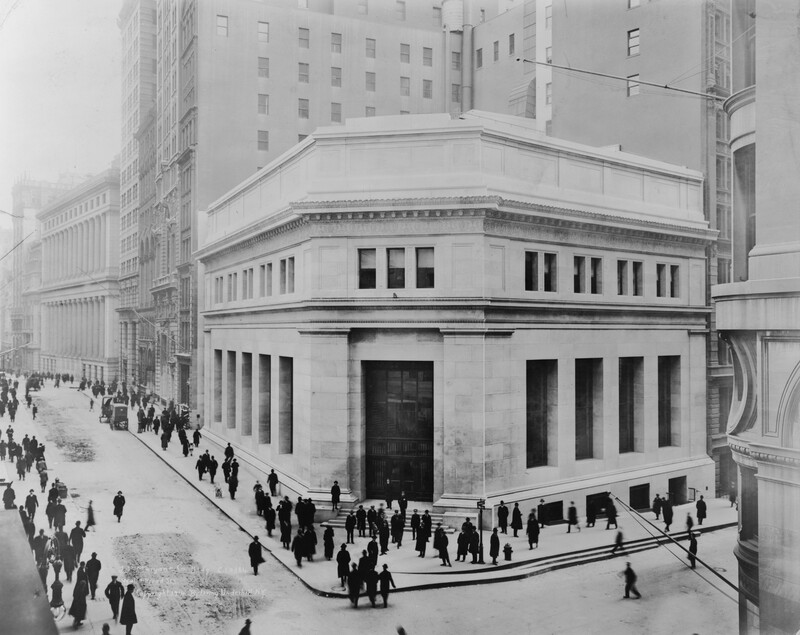 The “House of Morgan” or “The Corner” was the headquarters to the largest bank in the US and 6th largest in the world ($2.4 trillion). J.P. Morgan (railroad magnate, GE, AT&T, US Steel) died just before its completion. In 1920, a horse-drawn wagon bomb exploded shaking glass in skyscrapers three blocks away — the horse was atomized and its hooves found in Trinity cemetery! The worst bombing until 1995 with the perpetrators never caught. Pockmarks from the explosion are still visible on the building. 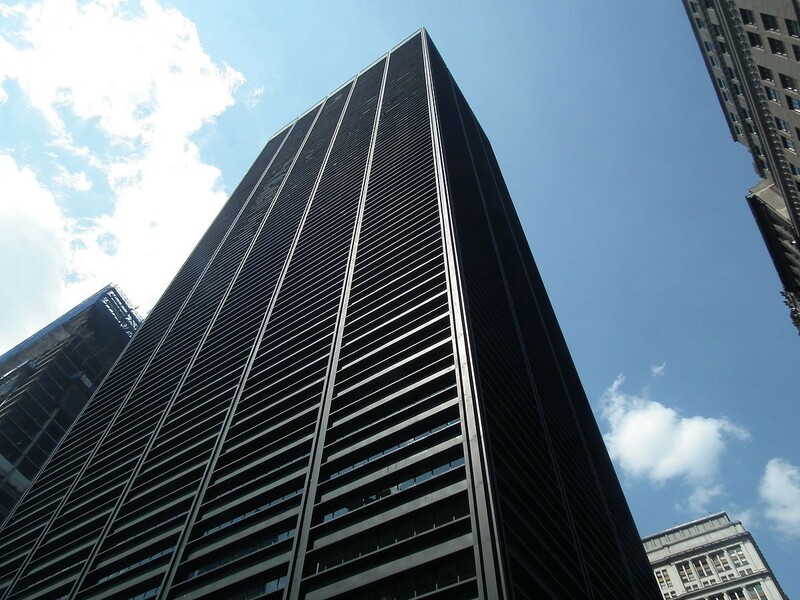 One of the earliest skyscrapers and (at the time) the largest office building in the world, heaviest structure in the world, and the most elevators. 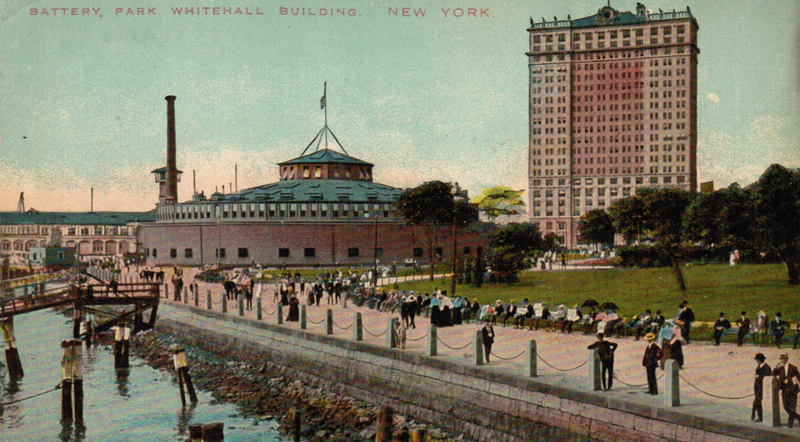 Construction without setbacks cast a seven-acre shadow (up to the 27th floor of the Singer Building, 24th floor of City Investing, and completely cutting off at least 3 other buildings) and led to zoning restrictions leading to “wedding cake” architecture for buildings such as the Empire State. Ironically, the building currently houses the offices of the New York City Department of City Planning. Originally the Equitable Life Assurance Society headquarters, it also housed an exclusive Bankers Club on the top three floors. In 1942, a seven-inch shell accidentally fired by an anti-aircraft battery struck the 37th floor (no injuries). In 1962, four window cleaners were killed when their scaffolding fell from the 19th floor. The parade route past the building is known colloquially as the “Canyon of Heroes” due to the imposing buildings. The ticker tape concept was created during a parade for the dedication of the Statue of Liberty when an office worker threw shredded paper from a ticker tape machine. A plaque along Lower Broadway for every parade — the most famous being Apollo 11 featuring Neil Armstrong and Buzz Aldrin and attended by four million people! Former AT&T Building and Western Union headquarters, which had a 70m (230ft) tall clock tower with a “Time Ball” that dropped at noon each day to serve as a the starting point for Standard Railway Time. Boasted the world’s most facade classical columns (198), 50 Doric columns in the lobby, and the most marble of any New York building. Here Alexander Graham Bell made the first trans-continental call and the president of AT&T made both the first trans-Atlantic call and first video call (in 1927!). 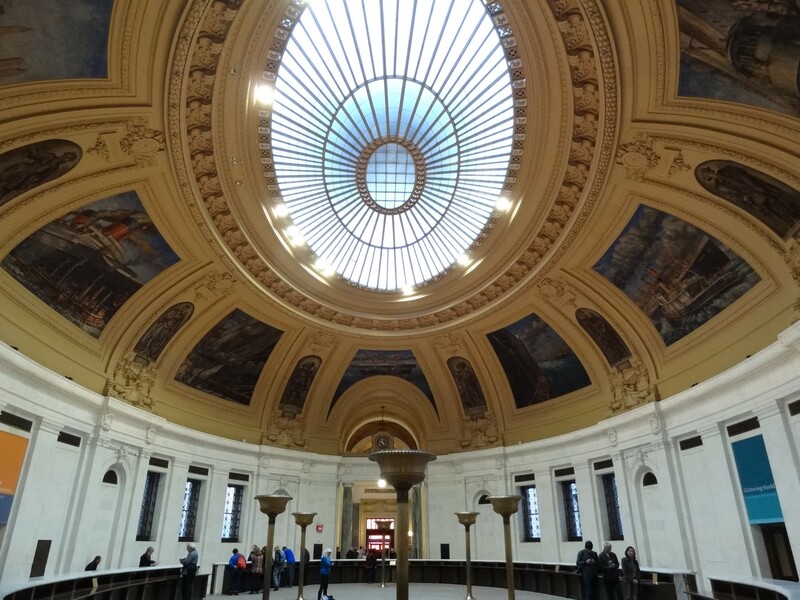 The “Standard & Poors Building” has a grand entrance hall and domed hall with impressive interiors. A post office with events space located on a section of Broadway previously known as “Steamship Row” due to a number of shipping line headquarters. 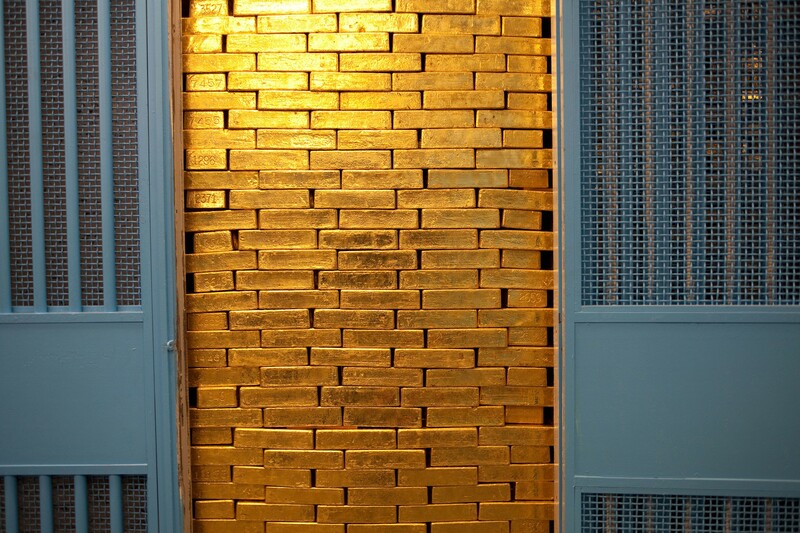 Reputedly (Swiss banks don’t reveal their gold stocks) the world’s largest gold repository with roughly 25% of all that exists (7,000 tonnes, $415 billion). Nearly 98% of the gold is owned by foreign nations and guarded by the Federal Reserve at no charge (but $1.75 per bar to move). Has a scale so precise the ventilation needs to be turned off and each bar is worth ten times the average American salary. With one of New York’s deepest basements, the vault is 80ft below sea level and is open to tourists (a cheeky “Help yourself!” sign). Guards are all marksmen, but most are rated expert marksmen. The 230-ton revolving door is the only entrance. $100 million worth of shredded banknotes are distributed as parting gifts. In 2012, a terrorist attempted to detonate a bomb and was sentenced to 30 years prison. Appears in the films The Godfather (“meeting of the Dons”) and Die Hard with a Vengeance. 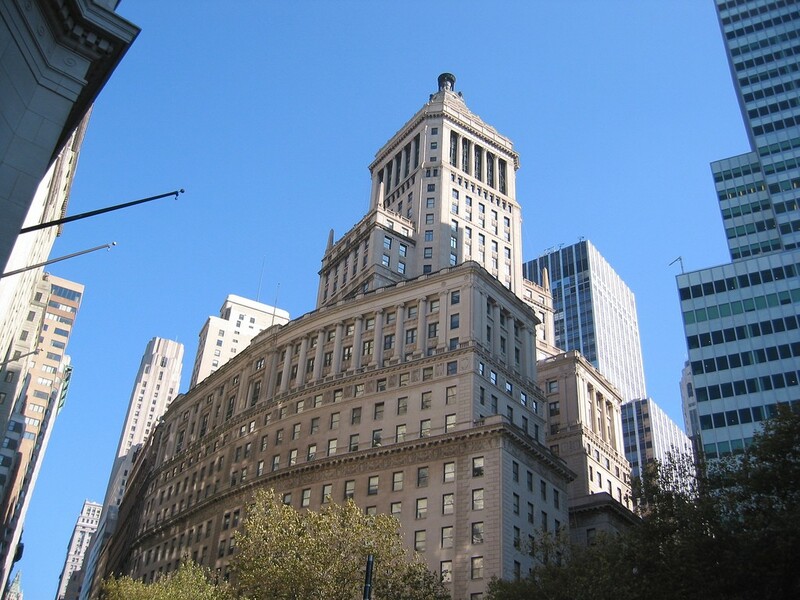 The Standard Oil (now ExxonMobil) Building sits on the site of Alexander Hamilton’s home. The pyramid on top was modeled on the Tomb of King Mausolos and crowned with torches — a symbol of the oil industry. The Trump Building (originally the Manhattan Company Building) was completed in just eleven months. It lost the title of tallest building after less than one month to the Chrysler building, which hid a steel spire inside the building before being hoisted into place! Nevertheless this building had the highest usable floor in the world. In 1946, during heavy fog an army airplane crashed into the 58th floor killing 5 people. In 1982, the building was found to be owned by the President of the Philippines (whose assets were frozen). In 1995, it was purchased by Trump and renamed. Formerly the American International Building, it was the tallest building in lower Manhattan until the 1970s and for 75 years, the tallest building in New York. Originally built with double-decker elevators that served two floors at once (due to limited elevator shafts) run by a team of beautiful redheads. 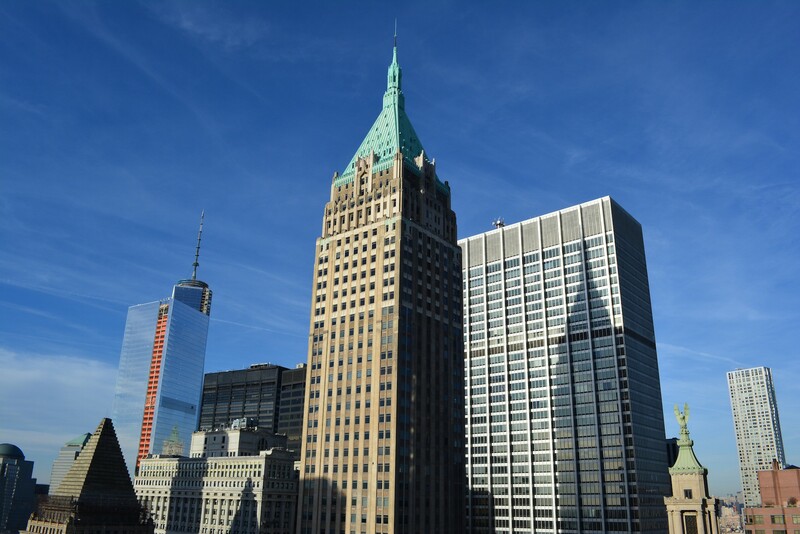 Features an open air viewing platform and enclosed glass observatory on the 66th floor (closed to the public) and miniature 12ft scale carvings of itself on the north and south facades (complete with their own miniature carvings!). Luxury residential apartments as of 2016. Formerly Liberty Park (renamed 2006) and once the site of New York’s first coffeehouse — The King’s Arms. In 1773, site of the first public demonstration against the British Tea Act. Park contains the sculptures Double Check and Joie de Vivre — the latter which was climbed by a protestor during Occupy Wall St.
A privately-owned public space 30ft above street level that allowed developers to increase the total square footage of 55 Water Street beyond what zoning regulations would otherwise have allowed. 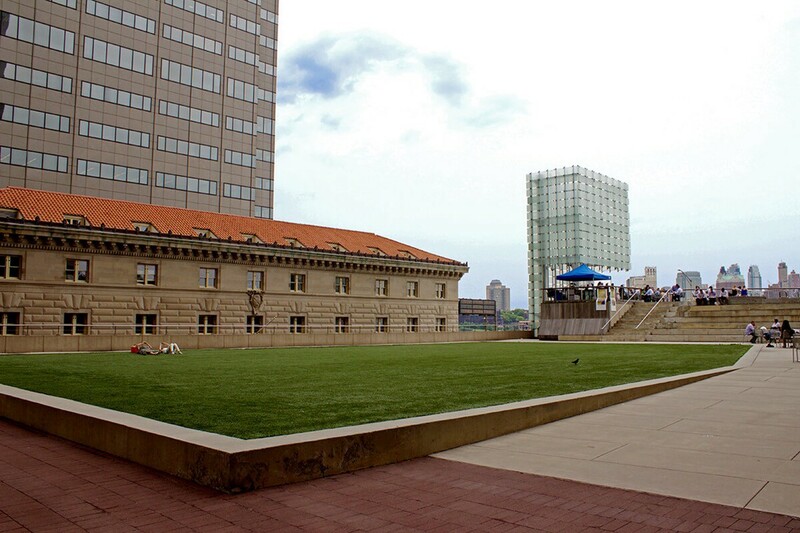 Astroturf with good views — occasionally hosting free movie screenings. The 50ft tall Beacon of Progress sculpture glows at night. Former U.S. Steel building on the site of the Singer Building — the largest structure ever dismantled (in 1968). Brooks Brothers on the ground floor of the building was used as a temporary morgue in the days following 9/11. Twelve granite slabs with the names of the 1,741 New Yorkers who died during the Vietnam War — including the youngest American serviceman killed during the war (age 15). $360,000 guerrilla art piece installed beneath a 60-ft Christmas tree in front of the Stock Exchange — a gift to the city as a symbol of strength and power following the 1987 market crash. Impounded and reinstalled (albeit in a different location) due to public outcry. The statue is still owned by the artist (who sued Walmart and Random House for using its likeness) and has been on temporary permit (normally one year) since 1989! Other bulls have been installed in Shanghai and Amsterdam. Tourists rub the scrotum for good luck. Former headquarters of the The Bank of New York, which founded in 1927 by Alexander Hamilton and one of FDR’s ancestors; it was also the first stock traded on the NYSE and site of the first US bank robbery. 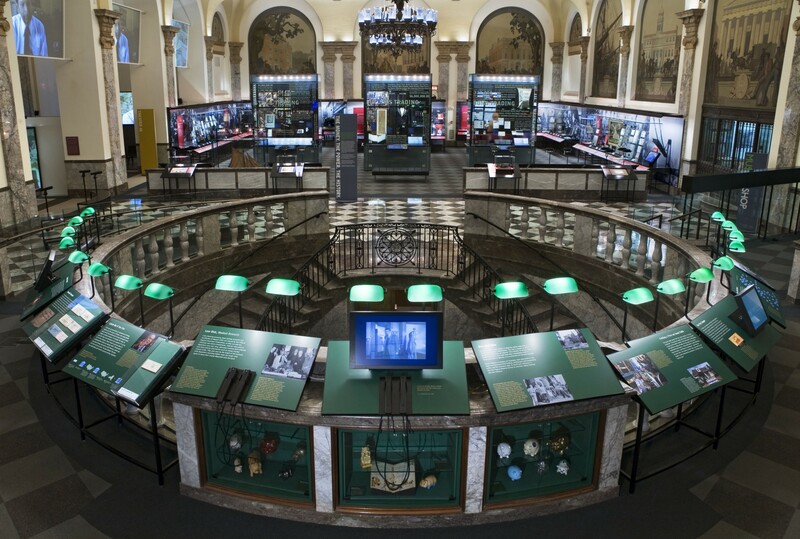 The only independent public museum on financial history in the US. The collection contains over 10,000 stocks, beaver pelt, wampum (Indian clam shell currency), some of the earliest American paper money, a pit trader glossary (hand signals), the first ticker-tape machines, a Bloomberg Terminal, and an anti-counterfeiting measure invented by Benjamin Franklin. One of nine specialized tuition-free accelerated academics high schools in the US and one of the best public schools nationwide (with a 2.7% acceptance rate). Ran double sessions (students attending during different periods of the day) from 1919 to 1956. In 1956, six students constructed a cyclotron particle accelerator that caused a power loss to the school and surrounding buildings. Predominately Asian (73%) and Caucasian (21%) students. Contains the artwork Mnemonics — 400 hollow glass containing objects such as a section of the Great Wall of China, fragments from the Mayan pyramids, leaves from the Bo tree, and water from the Nile and Ganges rivers. 88 empty blocks for the next 88 graduating classes. Notable graduation speakers include Bill Clinton (2002), Kofi Annan (2004), Conan O’Brien (2006) and Brandon Stanton (2015). Notable alumni include Robert Moses, Thelonious Monk, Lucy Liu, Tim Robbins, James Cagney, Paul Reiser, and four Nobel Prize winners. Sculpture garden, Lily Pond, ping pong, billiard tables, basketball, hardball — and a Parkhouse with games and toys from the 1960s. A six-sided building (symbolic of the six points of the Star of David and the six million Jews who perished during the Holocaust) containing more than 25,000 items and topped by a pyramid structure called the Living Memorial to the Holocaust. A 2013 memorial garden is the first permanent commission in New York — and was planted by the artist, Holocaust survivors, and their families. The only museum of its kind in the world for a city with the second-most skyscrapers (behind Hong Kong). There is no official definition of a skyscraper. The second-largest park (after Central Park) is a result of a failed highway redevelopment known as the Westway. After two decades, 70 percent of the park has been completed as of 2015. Originally Native Americans lived seasonally in a place named Sapohanikan near the present-day intersection of Gansevoort and Washington streets. Memorial to the Great Irish (potato) Famine of the 1850s, which caused a massive emigration to the US — New York became a quarter Irish! Resembling an Irish countryside, it contains all native Irish plants, boulders from all 32 Irish counties, and a reconstructed 19th century cottage. Scheduled to reopen in 2017. Gifted on the 15th anniversary of the fall of the Berlin Wall during a concert overlooking the Statue of Liberty. 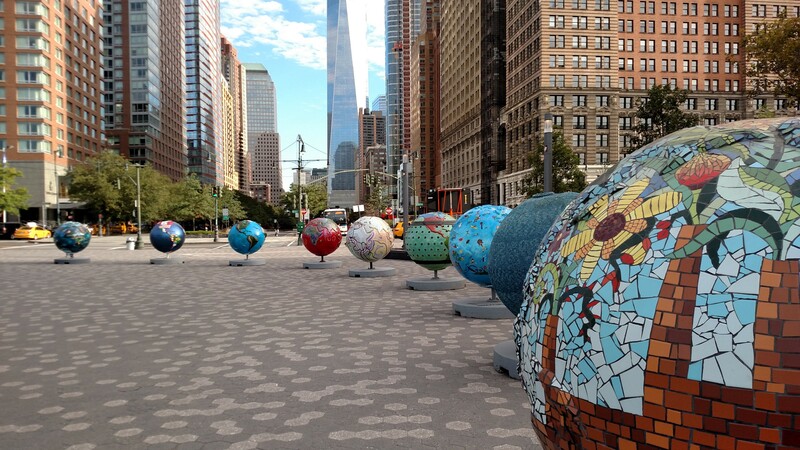 Installed in Kowsky Plaza. 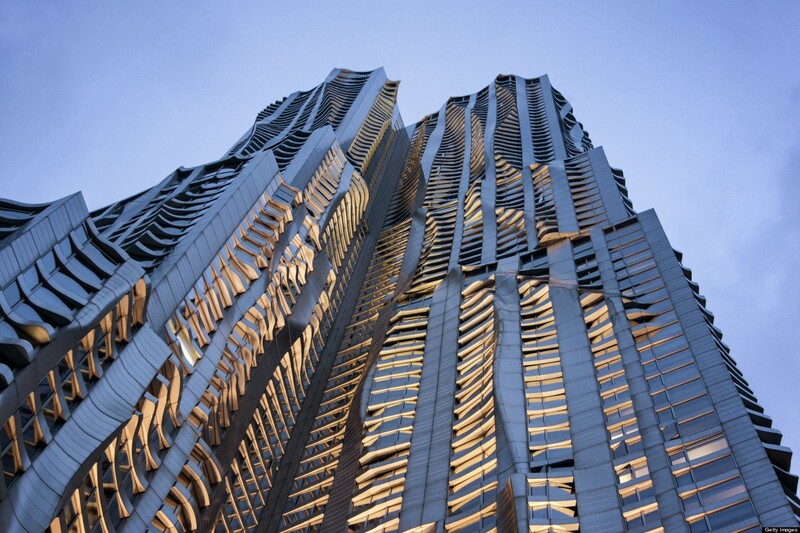 Frank Gehry-designed building formerly Beekman Tower and currently marketed as New York by Gehry. One of tallest residential towers in the world (76 story, tallest in Western Hemisphere when built). First five floors are a school and all residential units are rental only. 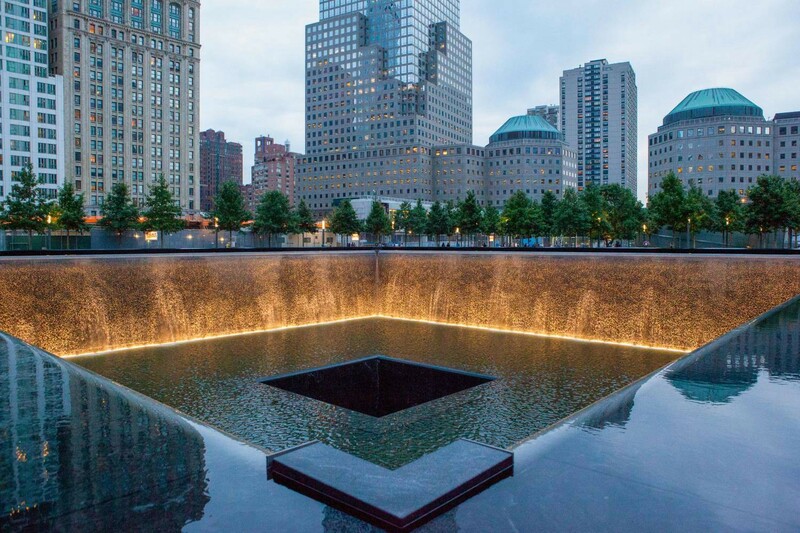 The “9/11 Memorial”, Reflecting Absence, consists of a field of trees interrupted by two large recessed pools — the footprints of the Twin Towers. Inscribed are the names of the victims of the attacks (including those from the Pentagon, American Airlines Flight 77, United Airlines Flight 93, and the 1993 World Trade Center bombing). The names are arranged according to an algorithm, creating “meaningful adjacencies” based on relationships. The phrase “and her unborn child” follows the names of ten pregnant women who died on 9/11 and one who died in the 1993 attack. A pear tree recovered from the rubble was replanted and later named the “Survivor Tree” (six other “survivor trees” have been planted near City Hall and the Brooklyn Bridge). The largest manmade waterfall in the US. Don’t take selfies. Police cadet and first responder, Mohammad Salman Hamdani, was not included with the other first responders or the other victims whose remains were found in the wreckage of the North Tower. Instead his name appears on the memorial’s last panel for World Trade Center victims with those who did not fit into the groups created by the memorial committee. The “Freedom Tower” is the tallest building in the Western Hemisphere (4th in the world) standing 1,368ft tall — the exact height of Twin Towers — and 1776ft with the spire (in reference to the Declaration of Independence). It shares the same name as the original north tower, has a nearly identical footprint as the Twin Towers, is the safest office building in the world (high-strength concrete, pressurized stairwells, ventilation filters, blast-resistant windows), and the most expensive ($3.9 billion with $1 billion from 9/11 insurance) building at the time. Contains a three-story observation deck on floors 100–102, cafe, bar, and fine dining restaurant. Condé Nast is the largest tenant and occupies floors 20 to 44. In 2012, the America’s Response Monument (2011, monument to the War in Afghanistan) was relocated in front of the tower. In 2013, four people were arrested for base jumping. In 2014, a 16-year-old boy dressed as a construction worker snuck up to the 104th floor. Goes to floor 104 despite the fact the tower has 94 actual floors! 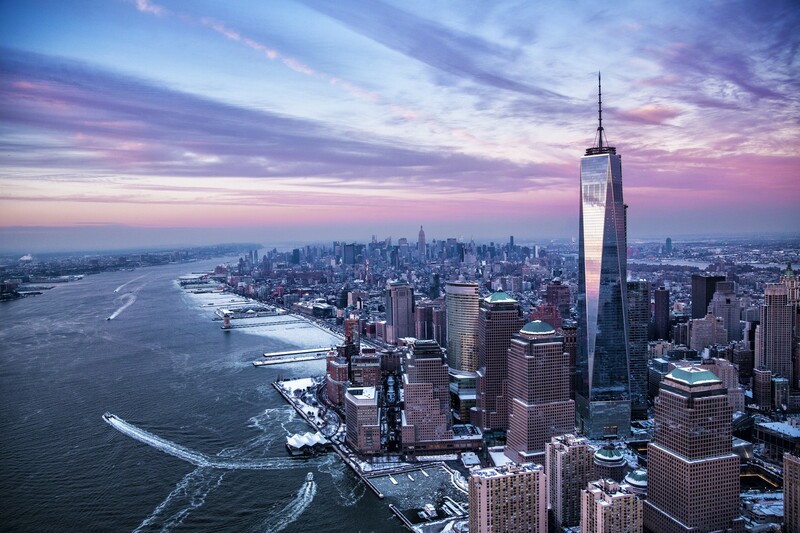 The previous One World Trade Center included Windows on the World — a 107th floor restaurant with one of the most prestigious wine schools in the US and “The Greatest Bar on Earth.” It was the highest-grossing restaurant in the US. Resembling a partially collapsed building it contains 23,000 images, 10,300 artifacts (two tridents from the facade, the final steel removed from Ground Zero, wrecked emergency vehicles, metal from all seven World Trade Center buildings, survivor’s stairs), 2,000 oral histories (including 9/11 phone calls) and over 500 hours of video. 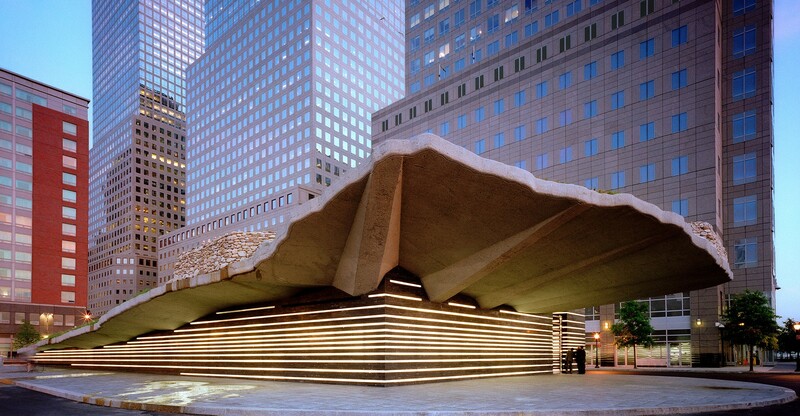 Built on the former location of Fritz Koenig’s The Sphere (now in Battery Park), which stool between the two towers. One of the museum walls is an intact retaining wall. 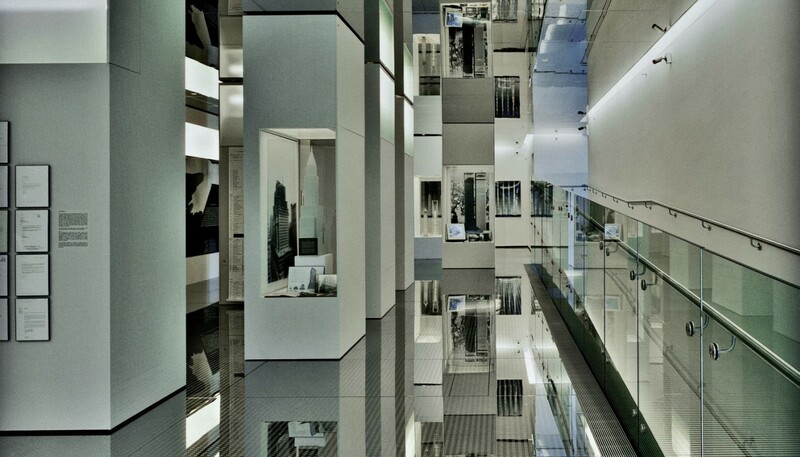 The museum is designed to evoke memories without distress. Criticisms have been made at the high ticket price ($24), souvenirs in poor taste, a VIP cocktail party for donors, a proposed Danny Meyer restaurant, and the burial of the remains of 1,115 unidentified victims in a non-prominent tomb 70-feet below ground. The World Trade Center site was once part of Little Syria, the center of Arab life in the United States since the 1880s. This is not mentioned. “American Express Tower” at 200 Vesey Street (1985), formerly Three World Finanial Center, is the current Amex world headquarters. It contains Harbors of the World — one of the largest murals (11 x 318 feet) by a lone painter (at a rate of 10ft per month!). The Winter Garden Atrium (1988) is a large glass public space with a grand staircase, sixteen 40ft Mojave Desert palm trees, luxury shops, and upmarket food court (Hudson Eats). Hosts art exhibits, music, shows, and movie screenings. All 2,000 panes of glass were blown out during 9/11. At One North End is the New York Mercantile Exchange (NYMEX) — a commodity futures exchange handling billions of dollars of trades. Until 2016, it retained a small open outcry system (the “pit”) of shouting and complex hand gestures. 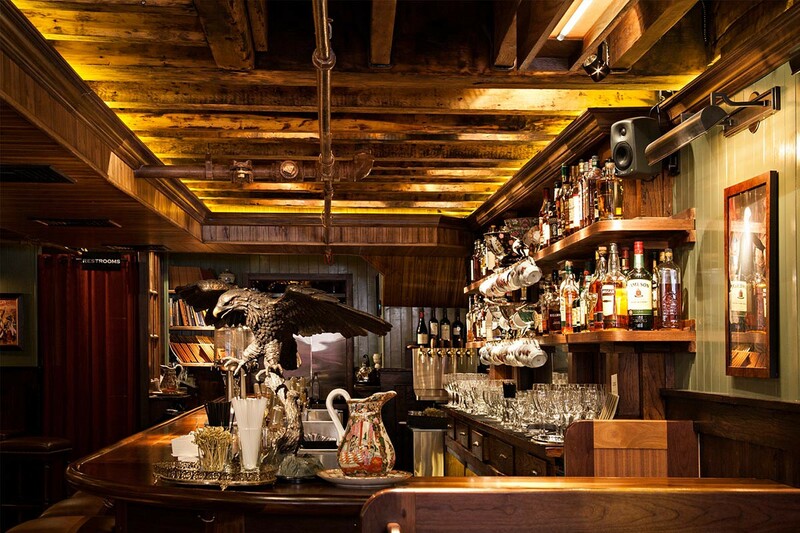 An Irish-American tavern awarded the World’s Best Cocktail Menu (2013), International Bartender of the Year (2013), and World’s Best Bar (2015). Founded by a bartender from London’s Milk & Honey and named after an Irish-American street gang from the 1850s. The menu is a graphic novel. A commoner’s tap room downstairs (sawdust on the floor) offers beer, bottled punch, and Pop-Inns (a mixture of beer and liquor). Upstairs provides cocktails (72 historically accurate cocktails), communal punches, 145 varieties of Irish whiskey, food and Irish groceries.